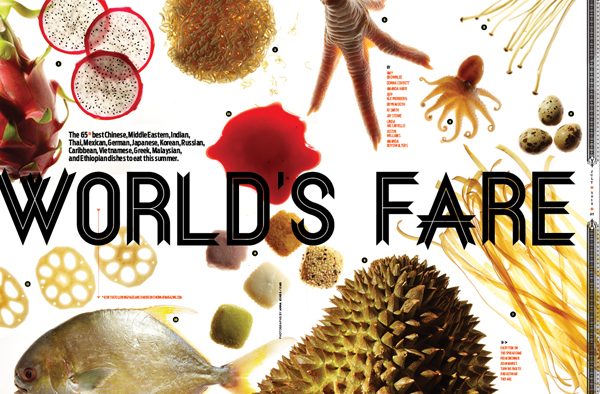 We found more dishes than we could fit in the print version of our story on global cuisine. Cilck here to check out the World’s Fare photo gallery. Or click on the dish names to see a photo (not all dishes have images). Like everything else in this wee Covington restaurant, these pork wontons are made by hand. Wrapped in house-made egg dough, the bite-size nuggets are boiled and topped with a thick, almost paste-like red-pepper sauce (“Dragon Sauce”) that will make your nose run. Cilantro adds a clean, green flavor, but the heat is definitely on. Even so, we betcha can’t eat just one. Duck has been a staple of Chinese cuisine for hundreds of years—a recipe for roasted duck was even found in a 14th century cookbook. Yat Ka Mein’s version is fried, not roasted, but don’t let that dissuade you. Available by the half or whole bird, the skin is crisp, the meat is tender and juicy, and the five-spice seasoning brightens the duck’s naturally rich flavor. This dish doesn’t appear on the menu, but is always available as an ongoing “special.” Wide, flat rice noodles imported from Chicago are wok-fried, soft on the inside and crunchy on the outside, providing a base for veggies or your favorite protein and a sauce that sparkles with ginger, bean sprouts, and green onion. Spice it up as much as you like, but proceed with caution: When you go above 5 on Amerasia’s 1-to-10 heat index, ghost peppers are involved. So, kimchee leaves you slightly puzzled but you want to try it for the potential health benefits? An order of this rice is your gateway drug. Fermented vegetables can be a bit intimidating on their own, but mixed with rice, peas, egg, and bacon (! ), there’s just a bit of a tang and a slight vegetal crunch—basically, a good side or quick lunch. Or a sneaky way to outsmart a picky eater. Fans of P.F. Chang’s: If you’re hitting up the Chinese-American chain for their much-talked-about appetizer, you can do better. The version served up in this former Arby’s (OK, the atmosphere lacks P.F.’s pomp) will pleasantly surprise you. Chicken, mushrooms, and water chestnuts are dressed in a lovely brown sauce with just enough spicy pizzazz that you feel it, but you’re not sweating it, especially since you’ve wrapped it all in a cooling iceberg leaf. Try it. You can thank us later. You think you know lobster, and maybe you do, when it’s steamed with drawn butter or alongside a steak or popping up in mac-and-cheese. But you should make the acquaintance of this version, coated in a thick, sticky-sweet ginger and green onion sauce. It brings out the sweet of the meat without being cloying or overpowering; it tastes rich without being heavy. For dramatic presentation, this dish can’t be beat. It arrives in a cast iron pot with a short handle, sitting on a square of foil on a small plate. The lid is whisked off to reveal a beautiful golden yellow curry sauce, boiling like mad. Once you’ve let it come down to an edible temperature, you’ll find large pieces of chicken (or your selected protein), hunks of fresh-chopped vegetables, and that sauce—a hit of curry backed up with peppery heat. You’ll find versions of hot and sour soup on menus all over town, but this variation is a standout. Bits of shrimp and scallops swim through the dark broth with thread-like enoki mushrooms. There’s a distinct vinegar tang, and a chili-infused heat, but not that gloppy, gelatinous texture that sometime occurs in lesser brews. Get the big bowl. You’ll want seconds. The Wong family makes magic with fish. Only the highest quality meat finds its way into their kitchen and to your plate. To really taste what that means, we suggest the steamed halibut with ginger green onion sauce. Cooked precisely, the halibut is flaky and the lovely light sauce adds flavor without completely overwhelming the elemental taste of the fish. Wunderbar doubles down on the curry in this popular street cart dish, beloved by Berliners of every stripe. Not only is the grilled sausage topped with the usual curry-spiked ketchup, but each wurst also has a shot of the spice blended right in. And like just about everything else at this exceptional Covington beer haus, it’s all made on-site from scratch. Do you want fries with that? Yes, yes you do. More to the point: You want fries with your gyro. Hot and crispy, these are elevated above your standard diner fries by several generous shakes of lemon-pepper seasoned salt. We’re not sure if that makes them authentically Greek, but they’re perfectly at home alongside Greek to Me’s piled-high classic gyro. Order a side of tzatziki (of all the yogurt-cucumber-garlic sauces in town, we like this one the best) for dunking. This family restaurant presents an existential conundrum: breakfast or lunch? Santorini serves up a full menu of Greek and American faves all day. Feeling breakfast-y? Go for the gyro omelet. The combination—slices of lamb and beef, diced tomato, onion, feta, and tzatziki—sounds weird in an omelet, but it totally works. The thin, crepe-like wrapper of egg makes this dish lighter than you’d expect, and the feta and tzatziki meld into a flavorful sauce. For lunch or dinner, the Greek pizza is a standout: fresh spinach, sliced tomato, red onion, mozzarella, and a basil-and-garlic-seasoning topping a good hand-tossed, pan-style crust. Craving the typical red-rimmed tandoori chicken? Dusmesh will be happy to oblige, but we suggest deviating from your standard order to try this culture-crossing dish. For the base of the Dusmesh Special, chicken is roasted in the traditional tandoor oven, then the moist, tender chunks are dressed with a light, sweet-sour sauce (à la your neighborhood Chinese restaurant, but better) and served over chunks of grilled onions and peppers. It’s an appetizer! It’s an omelette! It’s the seafood pancake you always see on Korean menus. Asiana’s version is plump with tiny shrimp, long rosy crabsticks, and green onions in an eggy yellow batter crisped at the edges. It’s served with a dipping sauce that comes in a lidded bowl shaped like a jam pot, making it difficult to dunk the moist squares. No matter, it’s still an addictive treat. Savory pancakes like this are a rainy day food in Korea—literally: they’re traditionally eaten when it’s dreary and drizzling, accompanied by rice wine. But even on the sunny afternoon we visited, nearly every table had a plate of haemul pajun. So much for tradition. A south-of-the-border cousin to the panini, La Mexicana offers more than 20 variations—all layered with lettuce, onion, avocado, tomato, cheese, and mayonnaise, all pressed between a massive sesame seed bun. The al pastor (seasoned pork shoulder) is a sure-fire winner, with the tender pork and spicy guajillo salsa playing nicely off the toasted crunch of the bread. (And yes, we touted it in our May sandwiches extravaganza—but it’s so good it deserves the hype.) Feeling more adventurous? Try the tripa (beef tripe), sesos (beef brains), or flor de calabazas (seasoned pumpkin flowers) as your main ingredient. Instead of a standard Mexicali burrito packed with carne asada, potatoes or French fries, and sour cream, this is more of a chicken fajita (with kicking onions and green peppers) rolled up in a colossal tortilla. Be sure to grab a fork. The finishing touches—smothering it in a warm queso blanco and a fiery salsa—will scratch the deepest parts of your culinary soul right where they itch. Nobody puts chimichanga in the corner. It’s a flour tortilla stuffed with ground beef and creamy queso, deep-fried to crunchy-outside-but-creamy-inside precision and topped with lettuce, tomatoes, sour cream, and yes—more queso. (Be still, my beating heart.) Good luck finishing the rice and beans that are served alongside it, too. Takeout boxes are essentially a necessity, and you have to wait 30 minutes before heading to the car. I’d go on, but you’ve already stopped reading and are on your way to get one. Despite originating in Spain, most Americans associate chorizo with authentic Mexican cuisine. Dinastia Latina is contributing to this cause in delicious fashion with its chorizo quesadilla, a massive flour tortilla folded over crumbled, browned chorizo and a healthy sprinkling of cheese. Dip in salsa, hot sauce, sour cream, or simply devour it as-is—there is no wrong answer. Plus, this family owned and operated bungalow is bring-your-own on the adult beverage front, so don’t forget to BYOT (bring your own tequila). Will they ever stop thinking up new and wonderful ways to cook ribs? We hope not. Exhibit A: Two thick and juicy pork spare ribs braised to the brink of melt-in-your-mouth tenderness and doused with a tangy hoisin-plum sauce. After polishing these beauties off in about 30 seconds, we had a eureka moment: This kra dook moo could get addictive. This was hands down the best larb gai we ate on our trek: A sharp, tingly-on-the-tongue mound of ground chicken studded with chopped white onion and cilantro, and tossed lightly with fish sauce, lime juice, bean sprouts, and rice powder. Fresh and spicy but not overly salty (which can be a problem in some restaurants), this Thai chicken salad is a great palate cleanser. Spoon it into crisp, cool lettuce leaves or just shovel it straight into your mouth. C’mon, you’re among friends! The great thing about Thai Express is that the kitchen is the restaurant. With only a couple tiny tables up front in the picture window, almost every order is to-go—but that in no way compromises the quality of the cooking. Working feverishly, the three-person staff whips up a wide array of traditional Thai cuisine, of which the pad grapao (holy basil stir fry, in this case with pork) is a standout. We ordered it at 4 on a heat scale of 1 to 10, which was just zesty enough. The pork (diced into fine little nubs) shares space in a mélange of onion, mushroom, purplish leaves of holy basil, and chilies, all of which triggered a wonderful umami reaction (our tongue picked up a pleasing smack of Worcestershire sauce). For the princely sum of an extra 50 cents, you can get a fried egg on the rice. Do it! It adds a wonderfully gooey richness to the rice when mixed with the pork. Also known as “blue ginger soup,” tom kha gai can be found on Thai menus all around town, often in weak, milky, just plain blah preparations. Take our word for it: The rich, velvety concoction that Chef Paendin “Toon” Yongkanaysin (formerly of Beluga) has created at Zab Thai is the bomb. It seems simple—a coconut cream broth infused with galangal (blue ginger) and stocked with mushrooms and thick chunks of chicken—but reveals itself to be rather complex. Slightly sweet with a sharp, vinegar-like edge that pulses with an inner heat. Mmmm, soup is good food. As with most Asian dishes, it’s about the yin and the yang: a balance of sweet and salty, sour and bitter, heat and cool. Here it’s sweet mahi flesh coated in gingery, peppery turmeric, bright fennel fronds and pungent onions, the saltiness of peanuts, and the ever-present fermented fish sauce, perched atop slippery bun (vermicelli) noodles.